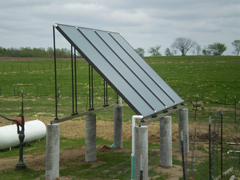 Solar thermal systems are a proven technology. They have been producing free energy in thousands of buildings throughout the Midwest for decades. Water heating is the second largest energy expense in most homes. 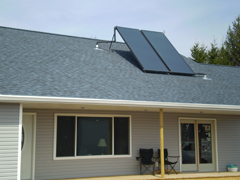 A properly sized solar hot water system can save 50%-70% annually on your water heating bill. A solar space heating system can trim your heating bill by 30%-50%, reducing the need for high priced fossil fuels. Reindl Plumbing Inc. brings years of plumbing and heating systems experience to your solar installations. For example, customers still have systems operating which were installed in the early 1980’s. Solar systems are a reliable and cost effective method of harnessing the sun’s energy. Reducing the consumption of fossil fuels preserves natural resources and protects the environment by lessening the amount of pollutants emitted by fossil fuel burning equipment. You can feel good about doing your part to help the environment. The financial benefits to you by going solar will keep getting better and better as fuel prices increase. No one can raise your cost of sunshine!! There has never been a better time to invest in a solar system than right now! GO GREEN, GO SOLAR, DO IT NOW! Use our experience, reputation and passion to get the most efficient and cost effective system for your home or commercial needs. Contact us today to set up a project evaluation meeting.